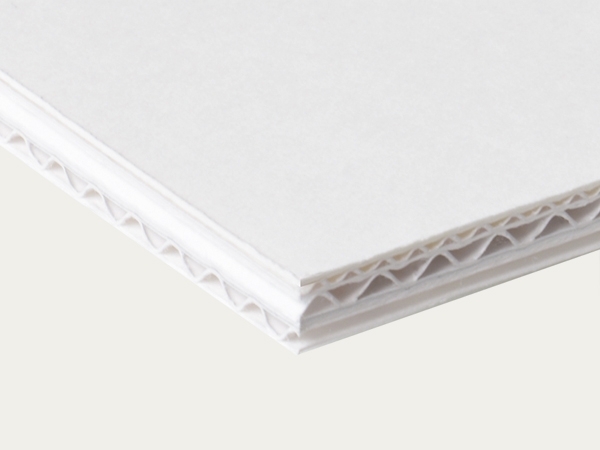 Triple wall corrugated board made from ageing-resistant material, overall thickness 8.0 mm, natural white in colour. Flutes in crosswise direction (cross-laminated) with thicknesses 3.0, 1.5 and 3.0 mm. Top ply made from conservation board, weight 365 gsm, natural white in colour. The board is ageing-resistant in accordance with the EN ISO 9706 standard, with excellent flatness and is breathable. Suitable as backing boards for conservation-quality picture framing.